Mike and I have been kicking around the question of “why don’t organizations act” as we get Buttered Side Down, the historic risk management consultancy off the ground. 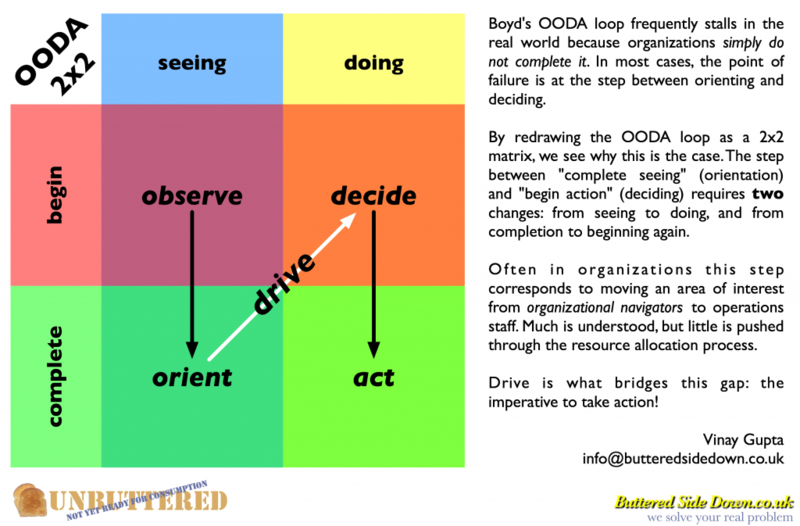 One thing we’ve come up with is this revision of John Boyd’s OODA loop. Boyd was a fighter pilot, and he lost most of his fights with bureaucracy. We think there’s a reason for that. The OODA2x2 model suggests that there are two pairs distinct of activities in the OODA loop: beginning and completing, plus seeing and doing. In organizations, senior people begin things, and junior people complete them. Senior people see things, and junior people do them. This creates an implicit problem getting organizations to change based on observations: the organizational hierarchy is polarized along the OODA loop. Let me say that again: the organizational hierarchy is polarized along the OODA loop. Senior people see and begin, junior people do and complete. This tension, between the ranks of an organization, then becomes friction. The tension between senior and junior people plays out along the OODA loop, where it slows real change. Deming‘s “drive out fear“, plus modern network theory, may be essential adjuncts to OODA in implementing effective organizational change on the time scales required for mitigating historic risks. The OODA2x2 model is rated Unbuttered. Looks like a promising step forward. 1) Alan Kay built into Smalltalk three top-level classes: reports, methods, instructions. Deming et al noted a fundamental “check-plan-do” loop in all action. Each of the steps in OODA may well contain such internal loops. 2) Bureaucracies in current forms are often blind to the whole person. Everyone operates with a concurrent business, civic, and personal frame of reference. Each of our frames can influence our decisions and actions within an organization as we evaluate reports, plan methods, and act on instructions. 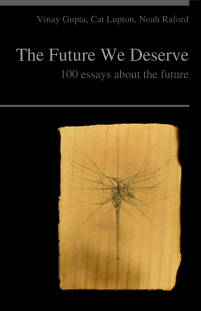 When big tradeoffs or dissonances arise between these frames in the individuals who make up a bureaucracy, one may expect the effectiveness of that bureaucracy to plunge. If this is the case, it follows that the highest-performing organizations will be those where internal incentives and values respect the “wholeness” (composite frames of references) of individuals — and where the focus is kept on the common ground of their shared institutional purpose. 3) Outcome measures need to be at the center of organizational purpose. In bureaucracies and nonprofit organizations, outcome measures — changes in measurable conditions of the public — can and should instill a bottom-line, profit-like discipline in the bureaucracy. Rewards recognizing contributions of individuals to the organization’s outcome goals can align the interests of individuals with that of institutions. This approach is toxic to rent-seeking forces that profit from an expanding state. The more a a measurable condition of the public worsens, the more likely politicians and bureaucracies are able — under normal circumstances — to justify increased funding. Political forces may in fact work against efficient and effective (outcome-centered) public sector organizations. In cases where a bureaucracy finds a cost-effective path, the political rationale to justify more spending weakens. – introduction of internal rewards (e.g. Singapore’s flexiwage) for innovations that contribute to desired outcomes. Look forward to more thoughts on this! There seem to be two great misconceptions about Boyd’s concept. One is that the goal is to get through the Loop faster than your opponent. Not quite: speed matters, but tempo matters more, as does the need to mask your intentions and unravel the other guy’s. Second, that all one need do is go through the Loop and bingo! the other guy’s plane is down in flames, or his queen is taken, whatever. No: every Action requires a new Observation, and around we go again. Rare is the decisive advantage. More likely we gain 10 degrees on the other guy each time, and it will take several Loops before we are on his six. A real problem in bureaucracies is that the already made decision by high authority often influences the observation and orientation of the entire organization, especially on subsequent loops. First: the juniors also observe and orient. They have observation and insight where the rubber meets the road. When they decide (“make up their mind”) what would be best to improve, they still have to act on it. And “act” often means feedback to senior management. There’s often breakage here, too. The OODA loop is really more of a loop than linear. You present it like a pipeline from senior management to the juniors. “They don’t listen”. But seniors need to act on the signals they get from the juniors, too. Actually, I don’t think you can split it like this. Seniors deciding to delegate to juniors: that’s acting. Juniors getting orders: that’s observing. And they’ve got to orient themselves in their environment: what does the order mean? How to implement/integrate it? Suggestion: try to apply the OODA at the organisation-as-a-whole level. The organisation needs to become better at every step. Improve the way the observations of the whole organisation are used, from senior to junior. And make sure acting happens quickly and decisively. Etc.